Everything about "Free Birds" feels perfunctory, from its generic title and holiday setting to its starry voice cast and undistinguished use of 3-D. The puns and pop culture references are bountiful in this Thanksgiving-themed animated adventure, but even by the standards of a kids movie, the wordplay is pretty lame. To play the filmmakers' game, there is simply too much stuffing in this bird: too many characters, subplots, gags and ideas, which include time travel, nutrition and genocide. Director and co-writer Jimmy Hayward ("Horton Hears a Who!" "Jonah Hex") offers a film that’s sufficiently colorful and cluttered with wise-cracking creatures—talking turkeys, to be specific—but with the possibility of death lurking about at all times, it never feels particularly lively. And it certainly doesn’t help that Hayward’s script, which he co-wrote with longtime Kevin Smith collaborator Scott Mosier (from a story by David I. Stern and John J. Strauss—why must these films always be cobbled together by committee?) bears such resemblance to superior movies. The time-travel element is reminiscent specifically of "The Terminator" and "Back to the Future," while the glorious "Chicken Run" depicted the idea of fleeing fowl in far more clever, charming fashion. But the best parts of "Free Bird" actually occur in the beginning, in the present day, before anyone has gone anywhere. Owen Wilson provides his familiar, nasal twang as the voice of Reggie, the smartest turkey on the farm and the only one who questions why he and his buddies get to eat so much corn every day. He realizes that the "turkey paradise" his pals dream of is actually their own vicious slaughter before ending up as the main course in a delicious Thanksgiving meal. When Reggie tries to warn his fellow turkeys about their imminent demise, they offer him up to the farmer for sacrifice. This puts him in the perfect position when the President of the United States arrives (whom Hayward voices in a Clintonian rasp) to choose a turkey to receive the annual pardon. Reggie gets to fly to Camp David, where he luxuriates in the wonders of trashy telenovelas, fuzzy slippers and pizza delivery. It’s no coincidence that the most fun Reggie’s ever had in his life is the most fun we have, too. From here, "Free Birds" flies in a wildly different direction, with Reggie being kidnapped and forced into a secret mission by a large, intense and possibly delusional turkey named Jake (Woody Harrelson). Jake insists that The Great Turkey has visited him and entrusted him with the responsibility of traveling back in time to Plymouth Colony in 1621, just before the first Thanksgiving, to keep turkeys off the menu and save his brethren for all eternity. (Never mind that turkey exists in sandwiches and chili and burgers and many other wonderful food items.) And what do you know? There just happens to be a time machine at Camp David (which goes by the code name STEVE and is voiced by George Takei). Magically, Reggie and Jake commandeer the craft and reach their destination. But once they arrive in the past, they find themselves the targets of Myles Standish (Colm Meaney), who’s trying to hunt as many turkeys as possible to feed the starving colonists as well as the nearby Native Americans for their upcoming feast. A feisty turkey named Jenny (Amy Poehler) and her father, the tribal leader Chief Broadbeak (Keith David), rescue them and the four join forces to a) destroy the humans’ weapons, b) rescue their captive brethren, and c) prevent turkey from becoming the staple of Thanksgiving feasts forever. Nothing in this complicated, convoluted narrative is ever particularly thrilling or funny. The romance that forms between Reggie and Jenny feels needless and uninspired, while the heart-tugging family drama at the end seems unearned and forced. 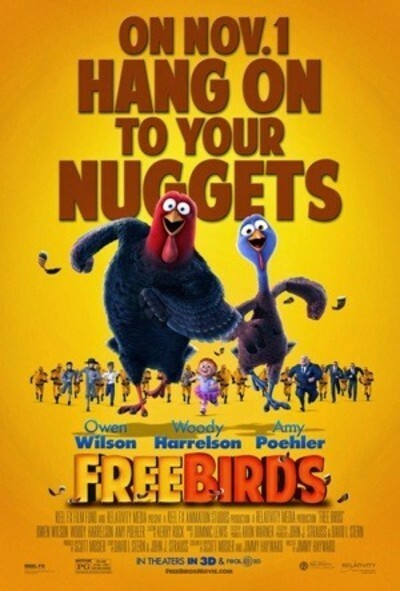 Worst of all, "Free Birds" aims for historical significance by using the turkey slayings as a metaphor for the cruelties Native Americans have suffered. In the end, very little about "Free Birds" is appetizing.